Due to huge demand we have sold out! There will be NO tickets on the door. 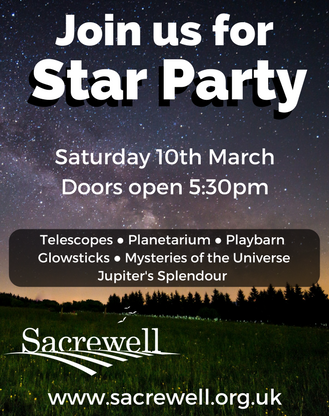 Peterborough Astronomical Society (PAS) are holding their biannual Star Party here at Sacrewell on Saturday 10th March. Don’t miss out and book your tickets online (SOLD OUT). We are very lucky to work with PAS who are incredibly passionate about the sky at night and will be on hand to talk to all those who attend-from beginners to experts. PAS bring along their telescopes and set them up on the hard standing near the barn so that visitors can look at stars and constellations (weather permitting). They also create a planetarium-style display and walk you through the sky at night, using apps and technology that is available to all and easy to use. We want people to go away inspired by what they see and learn at the Star Party and try to make it as accessible as we can-whether it’s using an app to identify a star, a constellation or advice on how to buy your first telescope. Doors open at 5.30pm and the event finishes at 9pm (last entry at 8pm) with a programme of talks and displays throughout the evening. Entry costs £6 per adult and children under 16 can visit for free. The entry fee includes access to the playbarn during these times, and hot drinks and snacks will be available to buy. Buy your tickets ONLINE and you can reserve a seat to the talks you’re interested in attending. You will also be able to visit the Planetarium every 40 minutes from 6pm (with 8pm being the last session). Whilst we will have plenty of seats throughout the evening, for safety reasons, numbers in each of the talk and planetarium presentations will be limited. We would like to suggest that parents with older children should plan to attend the later presentations so that we can be fair to our younger visitors and give them priority in the earlier presentations.